The antenna bazooka is a powerful, high-quality mono-band dipole that is easy to do yourself. At the ends of the coaxial cable, the sheath and the core are welded together and continue with a monopolar cable of copper. 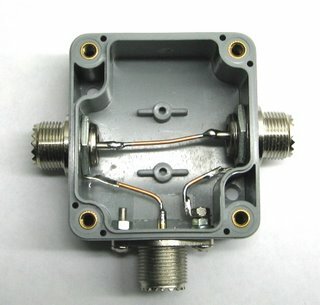 This antenna is ideal for its performance for QRP work. Due to the weight of the antenna, and the traction on the coaxial cable is advisable to cling to a long strand of nylon. Here is an overview of the dimensions in cm. Simone, Where do you get this box to create the center of the antenna? What is it called? I’ve found it at an electronic store, it does not a part name. thanks for publishing the antenna design with its interesting feeding concept. I am just wondering what is the advantage of this design versus a regular dipole with almost identical dimensions? As far as I know, bandwidth and constant low swr.